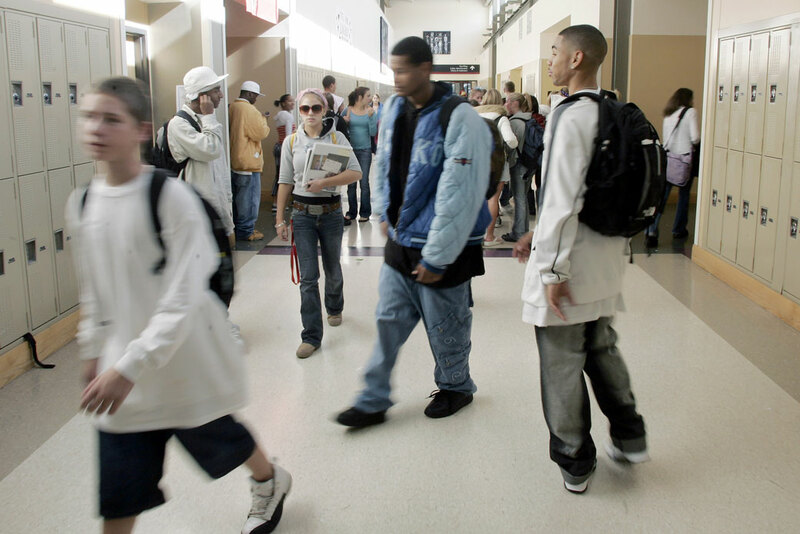 Students at Ballard High School in Seattle move through the halls between classes on October 20, 2005. Far too many school districts are intensely segregated by income and socioeconomic status, but Americans are largely in support of change. Austin, Texas, is one of the most racially diverse, culturally vibrant, and progressive cities in the nation. But for residents, the city splits into two worlds with vastly different living experiences. On the west side lies Austin’s affluent population: about 200,000 residents who have accumulated some of the greatest amount of wealth in the world.1 To the east, more than half of local residents live 200 percent below the poverty line.2 Although Austin, Texas, is considered “America’s next great boomtown,”3 it is also one of America’s most economically segregated cities. This report, however, emphasizes economic—rather than racial—segregation for a few reasons. Over the past decade, a growing number of schools and districts have integrated based on students’ socioeconomic status rather than by race or ethnicity. Part of the reason for this shift is a recent U.S. Supreme Court opinion that suggested it may not be constitutionally sound for schools and districts to integrate solely based on students’ race or ethnicity.15 Responding to this opinion, most school integration policies have shifted away from using race as a determining factor in student assignment. In addition, schools that are economically integrated are also usually racially integrated. And, finally, integrating schools by income rather than race allows schools and districts to move beyond the negative public opinion of so-called forced bussing and other racially charged policies of the past. The Center for American Progress hopes that this report’s focus on economic integration is reflective of current policies and practices and helpful for future stakeholders and policymakers. Furthermore, Donald Trump entered his presidency on a divisive campaign that threatened many of the bonds that hold modern Americans together. He called Mexicans “rapists.”18 He disparaged African Americans.19 At his rallies, he encouraged violence.20 In short, the nation needs an effort to bring its citizens closer together, and public schools are a critical space for teaching and embracing this nation’s diversity. CAP’s hope is that education leaders and policymakers will use this report to guide and inform their integration policies. It is no longer sufficient for districts to say that they are prioritizing integration; they must actually establish and enact policies to that effect. The information in this report, then, takes a first step toward providing the research necessary to understand the pervasiveness of economic segregation. To realize these aims, this report contains a wide variety of research. First, it analyzes results from a nationally representative survey, which assessed Americans’ perceptions of and ideas about school segregation. Second, the authors present findings from focus groups with parents of school-age children, describing their views on specific desegregation policies. Third, CAP partnered with EdBuild, a national nonprofit and policy studies organization, and analyzed data from more than 1,700 school districts to evaluate economic segregation within each district. Finally, the authors identified a handful of districts that have implemented socioeconomic integration policies and have relatively low levels of economic segregation. The authors relied on data about students’ eligibility for free and reduced-price lunch as a measure of poverty. 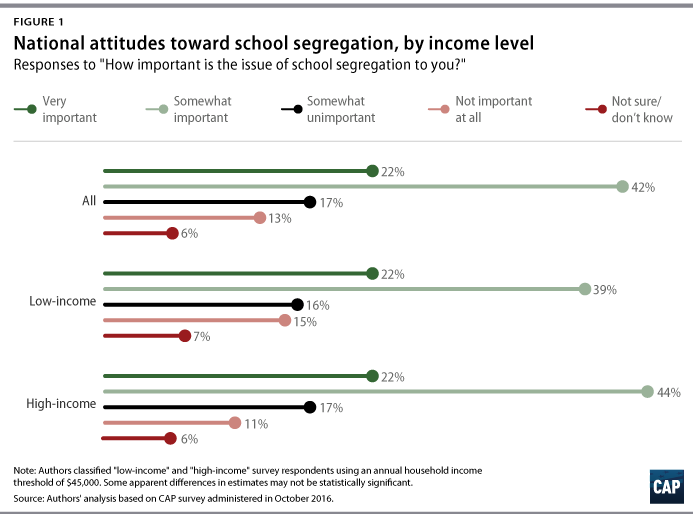 Nearly two-thirds of Americans consider the issue of school segregation to be “somewhat important” or “very important” to them, and 70 percent of Americans agree that more should be done to integrate low- and high-poverty schools. According to the authors’ focus group research, most parents believe in school diversity in theory, but they reject policies that limit the educational options for their child. Although research shows that all students gain immense benefits from economic integration, the public is not aware of these shared benefits. 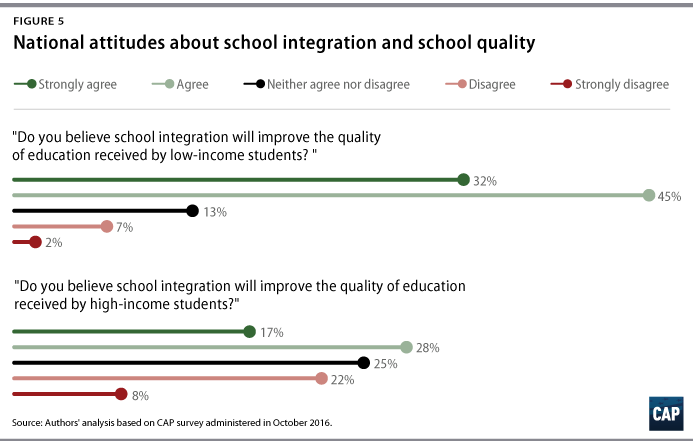 According to CAP’s survey, more than three-quarters of Americans agree that school integration will improve the quality of education received by low-income students, but less than half of the public agrees that integration will improve the quality of education received by high-income students. A growing body of research shows that learning in diverse classrooms is essential for students’ success in college, career, and life. To enhance diversity in public schools, and provide students the additional opportunities, resources, and benefits that lie within diverse schools and classrooms, CAP offers the following recommendations. Expand federal funding for economic integration strategies. The U.S. Department of Education should increase funding to existing programs supporting socioeconomic diversity and establish a new competitive grant to encourage more economically diverse districts. The federal approach should also go beyond schooling policy and encourage the development of mixed-income housing and other affordable housing opportunities for low-income families in affluent neighborhoods. Promote socioeconomic integration as a school improvement strategy. The Every Student Succeeds Act, or ESSA, includes a new provision for states to set aside at least 7 percent of their Title I funds for school improvement purposes. The U.S. Department of Education should issue guidance on leveraging these funds to create economically diverse schools as part of a school improvement strategy. Incentivize and/or require states to track and report patterns of school segregation. The U.S. Department of Education should create incentives, guidelines, and requirements for states to track and collect longitudinal data regarding student demographics and enrollment patterns. The department should require states to report this data in a way that informs strategies to diversify their schools. Incentivize the creation of high-performing, diverse-by-design charter schools. States should have dedicated funding streams that support the creation of high-performing, diverse-by-design charter schools. States can also incentivize charter school diversity through new competitive grant programs or by leveraging funds made available by the federal Charter School Program. Encourage regional enrollment models. State legislatures should establish laws and policies that not only allow but also incentivize schools to enroll students from diverse areas, including the development of regional charter schools that cross traditional school district boundaries. Equalize funding across and within school districts. States should equalize school funding across and within school districts. Across districts, inequitable funding systems promote economic segregation by making local areas overly dependent on local funding, incentivizing district leaders to exclude low-income neighborhoods from their borders. Within districts, well-resourced schools tend to serve affluent communities while under-resourced schools tend to serve low-income communities. States should equalize funding within and across districts to reduce these patterns of economic segregation. Track and report patterns of school segregation. The collection of longitudinal data regarding student demographics and enrollment patterns would enable school districts to thoughtfully address segregation issues, and would allow schools to purposefully locate in areas that are in need of more diverse schools. Support housing development as a way to foster economic integration in schools. States can foster economic integration in public schools by funding mixed-income housing development projects. States should also outlaw policies that exclude low-income families from wealthy neighborhood properties. Include parents in economic integration plans and provide specialized programs that appeal to a wide range of families. Districts should consult racially, ethnically, and socioeconomically diverse parents during the planning stages of integration strategies to build trust, create buy-in, and develop a more informed decision on diversifying their schools. Districts should also focus on methods of socioeconomic integration that appeal to families across a range of income levels. Implement controlled choice programs. Districts should consider income background and socioeconomic status in their student assignment systems. More specifically, weighted lottery systems can ensure schools have an economically diverse student body. These so-called controlled choice programs allow parents to rank-order their preferred schools, but district leaders can take into account the parent’s education level, income background, and special needs during the assignment process. Redraw attendance zone boundaries to ensure neighborhood schools pull from an economically diverse student population. Districts should shift away from the traditional notion of a neighborhood school and redraw attendance zone boundaries so that they transcend neighborhood lines. When creating new schools to accommodate a growing population, districts should be strategic in placing these schools in areas located between low- and high-income neighborhoods. Partner with county agencies to create inclusionary zoning policies. School districts should partner with housing agency officials, elected officials, and other municipal government leaders to investigate segregation patterns in their communities. Leaders should work together to create inclusionary zoning policies that require the creation of affordable housing in higher-income neighborhoods. This measure will help create more integrated neighborhoods and, ultimately, diverse schools. Fund capacity-building efforts. Even if a school is well-integrated, segregation patterns can still take place at the classroom level. It takes intentional work from school leaders, as well as classroom teachers, to develop a school curriculum and culture that meet the needs of a culturally and economically diverse student body. Thus, districts should invest in the development of successful learning models for diverse schools. There must also be additional research on the effectiveness of these integration methods, to ensure federal, state, and local policymakers are investing in evidence-based interventions proven to not only improve school diversity but also boost student outcomes. With the rapid changes in the economic and racial makeup of the nation’s public schooling system, researchers, scholars, policymakers, and practitioners can no longer afford to sit idly by as the country’s schools become increasingly segregated on socioeconomic lines. Since the Coleman report, study after study has shown that low-income children who attend high-poverty schools fare worse than low-income children who attend low-poverty schools. Since then, an increasing number of schools and districts across the country have adopted policies that create income diversity within their schools. Although the approach differs, the goal is the same: to create schools that serve both high-income and low-income students and ultimately improve academic and life outcomes for all students. During the 1990’s and early 2000’s, economic integration saw somewhat slow growth, with a few major school districts, including Cambridge, Massachusetts, and Wake County, North Carolina, instituting policies that created economically balanced student bodies within their schools. This report aims to shed light on the ways economic segregation shapes the public schooling system. Historically, however, the issue of school segregation has been about race. The authors acknowledge this history. For centuries, racially discriminatory policies—in both the North and South—separated black and white children and promoted a system of de jure segregation. The beginning of the end for state-sponsored segregation came in 1954 when the U.S. Supreme Court stated in Brown v. Board of Education that “separate educational facilities are inherently unequal.”37 Thanks in part to multiple court orders and strong federal enforcement, school districts began to implement racial integration policies.38 From the 1960s through the 1980s, there was a general growth in school district integration as an increasing number of states and districts heeded Brown’s mandate and created bussing policies and magnet schools that joined black and white students across neighborhood boundaries. Parents in low-poverty schools also tend to have a more flexible work schedule, which allows them greater time to give to the school community than low-income parents. Affluent parents also have the resources and social capital necessary to hold school officials accountable for school performance.51 When low-income students attend economically diverse schools, they benefit from these advantages accruing from middle- and high-income parents. Significantly, income diversity offers substantial benefits for every child in the classroom, not just those who are disadvantaged. Since economic segregation closely mirrors racial segregation, integrating schools by income will help create racial and ethnic diversity as well, and this form of diversity produces numerous benefits. For instance, one study found that students attending racially diverse schools are less likely to hold stereotypes, more likely to form friendships with students of different racial and ethnic backgrounds, and are more developed in cross-cultural understanding and tolerance.53 In a globalized economy where workplaces are increasingly diverse, being able to work productively with people from all walks of life is an invaluable skill. The evidence is clear, but it is important to note that achieving school-level diversity does not immediately eliminate all disparities that affect students. Issues of tracking, bias, and differential treatment can still disadvantage certain populations, even if the school community is diverse. However, meaningfully integrated schools provide opportunities for enhanced social cohesion, cooperation across lines of difference, and eventually greater life incomes. All students, regardless of socioeconomic status or race, are recipients of these benefits. When students learn in economically segregated school settings, they miss out on the incredible learning and creative opportunities that come from working with a diverse group of peers. The recent literature on economic segregation lists some specific drivers of increased isolationism, and the authors look at those topics in turn. The segregation of public schools often reflects larger trends of isolation in residential communities. Mixed-income neighborhoods are not the norm for most Americans. Residential areas tend to be homogenous in terms of race, ethnicity, and household income. Housing policies in the United States—from real-estate investments to lending practices and zoning ordinances—have formalized conditions of economic, residential isolation. While higher-income families can afford high-priced, affluent properties in sought-after neighborhoods, lower-income families are usually left with housing options located in lower-quality areas. Most students attend schools based on their neighborhood location, or their attendance zones. While this is the nature of traditional student assignment systems, the attendance zones often reinforce structures of residential segregation. Most often, more affluent students are zoned to schools filled with the affluent peers in their neighborhood, and lower-income students are zoned to schools with students of similar backgrounds. In extreme cases, however, attendance zones are deliberately drawn to exclude poor students from affluent schools.60 However, gerrymandering attendance zones is far less common than drawing zones that merely reflect the characteristics of the local area.61 Most school assignment systems sort students based on their place of residence, mimicking patterns of housing segregation. High-poverty districts also often border significantly wealthier districts. The neighboring districts of Detroit Public Schools and Grosse Pointe Public School System in Michigan offer a stark example of this trend. In Detroit, the median household income is $54,000,63 but in Grosse Pointe, the median household income is $101,000.64 Such stories highlight the saddening reality that, increasingly, wealth separates students at the classroom, school, and district levels. Schools in low-wealth neighborhoods raise smaller amounts of local revenue due to the weaker tax base. These school districts are less able to build beautiful school facilities, attract high-quality staff, and design compelling school programming. It is a situation that fuels a cycle in which parents who can afford high-priced properties flood to those wealthier areas, and the neighborhood schools receive greater funding for programs, supports, and services. The authors’ findings are outlined below. As part of this report, the authors conducted a survey that assessed Americans’ beliefs and attitudes toward economic segregation in schools. According to the survey, 64 percent of Americans consider the issue of school segregation to be “somewhat important” or “very important” to them, and 70 percent of Americans agree that more should be done to integrate low- and high-poverty schools. Counterintuitively, the survey responses among lower- and higher-income respondents were nearly identical. For instance, 22 percent of both low- and high-income Americans deem the issue of school segregation to be “very important” to them. However, the authors did observe racial differences in attitudes. 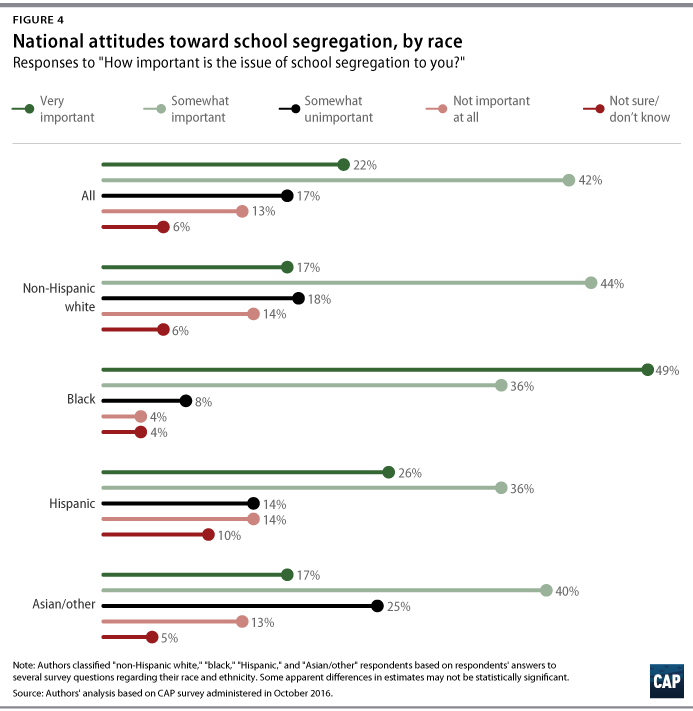 For instance, 49 percent of black respondents consider the issue of school segregation to be “very important” to them, compared to 26 percent of Hispanic respondents and 17 percent of non-Hispanic whites. In addition, 85 percent of black respondents agree that more should be done to integrate low- and high-poverty schools, and 50 percent strongly agree that more should be done. On the other hand, 67 percent of both non-Hispanic whites and Hispanics agree that more should be done, and the white and Hispanic respondents who strongly agree with this notion are 31 percent and 37 percent, respectively. Across all major subgroups, though, most supported the economic integration of schools. The authors conducted four focus group sessions with: white parents of low socioeconomic status; white parents of high socioeconomic status; African American and Latino parents of low socioeconomic status; and African American and Latino parents of high socioeconomic status. (Please see the Methodology section in the Appendix for more detail). Participants across all racial and socioeconomic backgrounds spoke to the value of school diversity. Many lower-income parents felt that economic diversity would substantially improve their kids’ quality of education. Among the lower-income whites, the expectation of additional resources going into an economically diverse school was an important factor. Lower-income African American and Hispanic parents also held a conviction that their kids will need to work in a world with more affluent people. White, African American, and Hispanic higher-income parents valued income diversity in schools because they believed that kids benefited from exposure to “the real world” outside their own community. Overall, parents generally felt that increasing diversity was a noble idea. Higher-income African American and Hispanic parents were considerably more positive than any other group. Many of them believed that they had personally benefited from attending schools with white and higher-income students when they were young. After benefiting from diversity in their own schools—as students and later as parents—these participants wished the same opportunity for low-income students. But parents were gravely concerned with issues of school quality, and they wanted economic integration efforts that supported their choice of a high-quality school. Specifically, they supported theme-based options such as technology-focused schools or dual-language schools that provided opportunities for students to master specific skills. Many parents were also worried about the impact of economic integration on school climate, and several parents were worried about the bullying that could take place when mixing kids of different backgrounds. According to the survey, bullying was seen as something that would go in both directions: “rich kids bullying poor kids, and poor kids bullying rich kids.” Focus group participants emphasized the importance of having school counselors who could work with students to ensure smooth transitions. Americans recognize that economic school segregation is a serious problem, but they express sometimes nuanced and contradictory views about which students are affected. But while Americans are aware that concentrated poverty exists, they are less aware of how this affects the distribution of low-income students across low- and mid-poverty schools. For instance, according to the Urban Institute, just 6 percent of low-income students attend a low-poverty school, but the public estimates this figure to be around 17 percent. These findings indicate that school segregation is much more complicated, nuanced, and pervasive than many Americans realize. On the whole, Americans believe low-income students are more likely to be in high-poverty schools than they really are, but they also think low-income students are more likely to be in low-poverty schools than the actual numbers indicate. There is also little awareness of the universal benefits of school diversity. 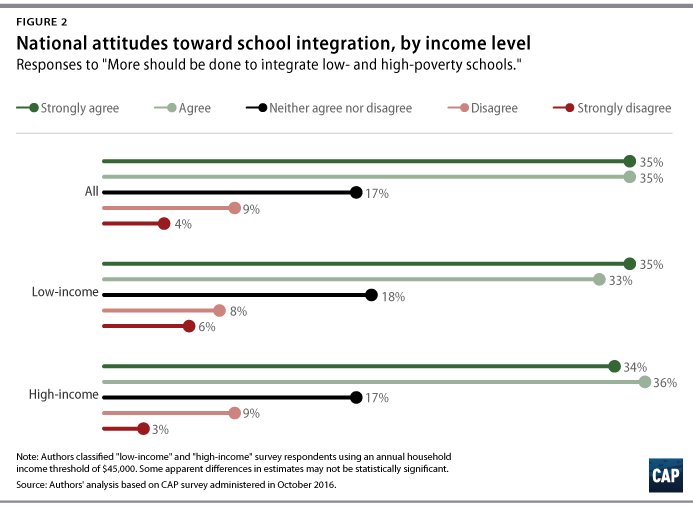 Most Americans assume that low-income students are the primary, if not sole, beneficiaries of economic integration policies. 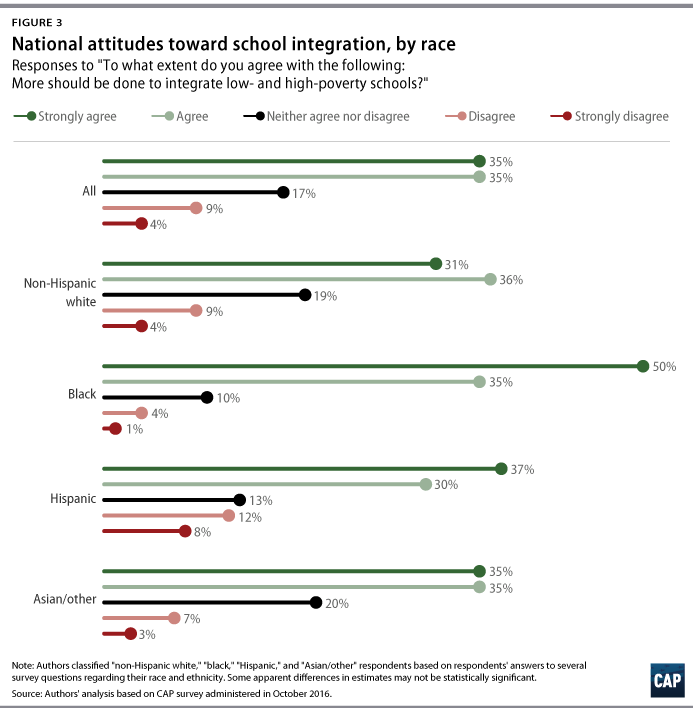 In CAP’s survey, for instance, close to 80 percent of Americans agree that school integration will improve the quality of education received by low-income students, yet only 45 percent agree that integration will improve the quality of education received by high-income students. And 30 percent of the public “disagrees” or “strongly disagrees” with this notion. While growing research shows that affluent students benefit from income diversity, most Americans are not aware of these shared benefits. In these 688 districts, most of their low-income students attend schools where at least 75 percent of their peers are also low-income, most of their higher-income students attend schools where at least 75 percent of their peers are also higher-income, and/or most of their schools have poverty rates that are at least 20 percentage points above or below the district average. These districts enroll approximately 15 million students and 50 percent of students in the CAP sample. The authors also find that these districts tend to be larger—both geographically and in terms of student population—than other districts in the sample. Although the sample is not well suited for estimating national trends, the sheer number of districts in the sample identified as segregated suggests that many districts experience intense economic segregation and isolation. It is also important to note that these districts cover 49 out of 51 states and encompass regions stretching from the Deep South to the Midwest and Northeast. The urban nature of these districts also varies. Some districts are located in densely populated, urban areas—such as Baltimore City Public Schools in Maryland—while others are small, rural districts such as Knox County Public Schools in Kentucky. From this the authors conclude that school segregation in the 21st century is not a South, North, urban, suburban, or rural issue. It is a national issue. The authors used three indices to measure different dynamics of economic school segregation: the Isolation of Poverty Index; the Isolation of Wealth Index; and the Hypersegregation Index. The Isolation of Poverty and Isolation of Wealth indices capture economic isolation in schools. In many districts, students in the area are either entirely low-income or entirely higher-income. Thus, these districts are highly segregated because they are economically isolated. For instance, the Isolation of Wealth Index captures districts such as Kentucky’s Oldham County Schools, which has a relatively low-poverty rate of 19 percent, is the wealthiest county in Kentucky, and is the 20th-wealthiest county in the country. For districts such as Oldham County to become more integrated, they would have to institute policies or programs that transfer students in or outside of their boundaries. Approximately 23 percent of districts among the authors’ sample were identified as hyperisolated under the Isolation of Wealth Index. On the other hand, the Isolation of Poverty Index captures districts that face high levels of poverty. Approximately 15 percent of districts among the sample were identified as hyperisolated under the Isolation of Poverty Index. Take, for example, Milwaukee Public Schools in Wisconsin, which has a poverty rate of 77 percent and an Isolation of Poverty Index score of .74. By this score, nearly three-quarters of Milwaukee’s low-income students attend high-poverty schools. The Hypersegregation Index calculates the share of schools in a district that have a poverty rate at least 20 percentage points above or below the district average. It is important to note that in this analysis, the authors applied a number of exclusions in order to produce meaningful and accurate findings in the Hypersegregation Index. For instance, the authors excluded districts with poverty rates of less than 20 percent or more than 80 percent– districts with extremely high or low rates can do very little to remedy segregation within their district boundaries.69 The authors also excluded school districts with fewer than ten schools. With these exclusions, the analysis excludes the vast majority of districts, but still accounts for nearly 60 percent of the total student population. Approximately 6 percent of districts among the authors’ sample—or 100 districts—were identified as hypersegregated under the Hypersegregation Index. Take, for example, Austin Independent School District in Texas, one of the most segregated schooling systems in the country. Austin Independent School District received a 0.77 on the Hypersegregation Index. This means that although the district, on average, has a poverty rate of 64 percent, more than three-quarters of the district’s schools have a poverty rate that is either 84 percent and higher, or 44 percent and lower. Please see Appendix for a complete list of the hypersegregated districts from the study. There are a few noteworthy findings from the Hypersegregation Index. First, Texas and California are overrepresented in this list. Although it is worth looking more deeply into the causes of segregation in each of these respective states, it is important to note that both of these states have more—and in both cases many more—school districts than all other states in the country: California has 1,178 school districts and Texas has 1,265. Second, the country’s most segregated school districts are larger than the typical school district. The 50 most segregated districts among the authors’ sample, for instance, enroll 41,000 students and operate 62 schools. Among the entire sample, these numbers are 16,000 and 27, respectively. These districts tend to be smaller, in terms of student enrollment and number of operational schools. On average, these districts operate 13 schools, enroll 6,000 students, and have a poverty rate of 48 percent. In addition, a disproportionate share of these districts are located in rural areas. Please see Appendix for a complete list of the 100 nonsegregated school districts from the study. CAP’s latest analysis shows that economic segregation still exists at high levels in the public schooling system. It is important to note, however, that the analysis may not capture more recent changes in enrollment patterns. The authors relied on data from the 2010-11 school year, and a handful of districts have since created new integration plans. For instance, the authors identified Denver Public Schools as hypersegregated in the analysis, but in recent years the district has introduced several reforms to diversify their schools. In addition, Denver Public Schools recently formed a partnership with the City of Denver to support affordable housing planning. A citywide committee, born out of this partnership, is developing policy recommendations for how Denver can diversify their neighborhoods and better integrate their schools.73 Denver Public Schools has witnessed marginal improvements in school diversity since implementing these reforms. Denver and Austin are not alone in this effort. Over the past decade, a growing number of school districts have implemented policies with the express purpose of integrating their schools by students’ economic status. Some school districts choose to use one method of socioeconomic integration in isolation and others utilize a number of methods in combination. School districts often consider improving both school diversity and school quality through programs with an innovative focus. These initiatives reduce economic isolation by offering specialized courses that appeal to families across a range of income levels. Since the launch of school desegregation policies in the 1960s, magnet schools have demonstrated the effect of incentivizing voluntary integration, both in terms of socioeconomic status and race, among families. Implementation widely varies, but magnet schools typically offer a specialized, theme-based program. Some operate on the traditional goals of promoting diversity, while others are academically rigorous, selective, and competitive but do not have a clear commitment to diversity. But it is not only magnet schools that can attract families from all along the socioeconomic spectrum: Charter and traditional public schools can also implement specialized programs that join students from diverse backgrounds. One increasingly popular focus among theme-based schools is the Montessori Method, a child-centered education approach that prioritizes the growth of the “whole child”—including their physical, mental, social, and emotional development.81 There are currently more than 5,000 Montessori schools across the nation. Growing research shows that Montessori schools create lasting, positive social effects.82 Since the Montessori Method focuses on personal development, Montessori students improve in their social and emotional intelligence at a faster rate than students in traditional education.83 In light of this finding, Montessori schools can be an important vehicle for integrating students of diverse backgrounds and fostering critical life and social skills needed for the 21st century. Some school districts have also found success placing these themed schools in low-income neighborhoods. By locating special programs in under-resourced and underperforming schools, districts can ensure that existing students have access to a better quality education while also attracting families who may not have previously considered enrolling. Charter schools have greater autonomy than traditional public schools when it comes to programming, and they can appeal to families of different income levels through innovation in curriculum, teaching, and learning methods. Charter schools are hardly a panacea when it comes to diversity, however, and current studies on the effects of the charter school sector on segregation have been mixed. One study by Duke University found that more than two-thirds of charter school students receive their education in intensely segregated settings.97 Similar research suggests that expanding charter schools may contribute to increased segregation without focused policy changes. As education experts Richard Kahlenberg and Halley Potter argue, school policies in recruitment, location, and transportation can either mitigate or drive charter school segregation.98 Some charters, for example, may be highly committed to diversity, but do not have much room to diversify because they are located in homogenous neighborhoods. Still, charters can foster greater school diversity. For instance, High Tech High—a high-performing charter school network in San Diego County, California—offers an intensive, specialized focus on STEM, and all 13 High Tech schools are highly diverse. What is key is a given school or network’s commitment to student diversity, as well as the local demographics. Another recent reform is carefully designed school choice programs, or controlled choice, which allow parents to choose their child’s school while also accounting for socioeconomic diversity. Controlled choice eliminates the default assignment of a neighborhood school in a district, removes traditional school attendance boundaries, and creates larger zones or catchment areas within the district. Parents can then select their favored schools through rank-order preference, but to ensure diversity, the district operates a weighted lottery system and reserves a share of seats in each school for low-income students. Berkeley Unified has a Hypersegregation Index score of 0, meaning not a single school in the district deviates from the district’s poverty rate by more than 20 percentage points. This is remarkable considering that some of the districts on the list of hypersegregated school districts have similar poverty rates as Berkeley Unified. Furthermore, Berkeley Unified does not operate any school with a poverty rate below 25 percent or above 75 percent, meaning its Isolation of Poverty Index and Isolation of Wealth Index scores are both zero. Berkeley Unified demonstrates the success of controlled choice, but like so many education programs, implementation is key. Without high-quality roll out, choice programs may actually heighten economic and racial isolation. Some choice systems operate on a “first come, first served” basis, for instance, and affluent families are often better able to complete the application on time. This has become a growing challenge in San Francisco’s choice program,103 as affluent families are more likely to place in the higher-quality schools while low-income families are left with the lower-quality options. However, controlled choice plans maintain parental choice without undermining the broader goals of school diversity. Stamford Public Schools scored a zero on the Isolation of Poverty Index and a zero on the Isolation of Wealth Index, meaning not a single student attends a school where 75 percent of their peers are of similar income background. To reduce residential, and thereby school, segregation, government housing agencies are increasingly promoting mixed-income housing. These developments provide affordable housing units for families across a range of income levels. Inclusionary zoning offers low-income families an opportunity to reside in traditionally affluent neighborhoods and have their children attend low-poverty schools. In the long run, these housing policies provide long-lasting benefits to the student, family, and greater community. Schwartz’s study also found that between 2001 and 2007, low-income children who resided in the inclusionary homes saw significantly greater gains than low-income children who remained in segregated neighborhoods.112 The academic gains persisted for several years after the students’ initial migration. The success of the program is based in part because inclusionary zoning allows for greater residential stability among low-income families, which in turn increases student achievement. A new and less common approach to economic integration has been school turn-around. New York state has been a pioneer in this regard. In late 2014, the state launched a first-of-its-kind desegregation plan—the Socioeconomic Integration Pilot program—using federal School Improvement Grant, or SIG, funds. Then New York State Education Commissioner John King spearheaded the three-year pilot program, which grants 25 schools up to $1.25 million each for the planning and implementation of school diversity plans. Significantly, the New York’s Socioeconomic Integration Pilot program requires schools to specialize their focus to appeal to middle-class families. Eligible schools can choose from a broad array of options, including dual language, STEM, visual and performing arts, Montessori, and career-themed pathways.115 Although implementation is just now under way, New York has set an important precedent in the use of state funds for economic integration purposes. Based on the findings presented in this report, CAP offers a series of recommendations for policymakers at the federal, state, and district level to facilitate the goal of making public schools more socioeconomically diverse. Expand federal funding for school economic integration strategies. The federal approach should also go beyond education. For instance, members of Congress can appropriate additional funds for the U.S. Department of Housing and Urban Development’s, or HUD’s, homeownership voucher program and expand income and eligibility requirements for low-income families. HUD can also provide grants to state housing departments to expand housing programs that ultimately result in more low-income students attending low-poverty schools. Promote economic integration as a school improvement strategy. In the Every Student Succeeds Act, states are required to set aside at least 7 percent of their Title I funds for school improvement purposes. The Department of Education should encourage the transformation of low-performing, segregated schools into high-performing, diverse schools. CAP believes that high-poverty schools would see greater increases in school performance if increased student diversity was a school improvement objective. Incentivize or require states to track and report patterns of school segregation. The Department of Education can create incentives, guidelines, and/or requirements for states to track and collect longitudinal data regarding student demographics and enrollment patterns. The Department of Education should require states to report these data in a way that informs strategies to diversify their schools. For example, the department can require each state to submit an annual report detailing the racial, ethnic, and economic makeup of each of its schools and districts, and how these demographics have shifted over time. This information should be shared publicly. Once it has this information for each state, the federal government could both support states in their efforts to diversify their schools and also penalize states that do not make progress toward school diversity. In addition, due to a recent Community Eligibility Provision, or CEP, reporting option, high-poverty schools and school districts that are eligible for CEP are not required to report the percentages of students who would individually be eligible for free- and reduced-price lunch meals.117 The Department of Education should amend this provision by requiring districts and schools who may be eligible for CEP to still report the income composition of their individual schools. The department should also consider devising a new measure of poverty. Most education stakeholders rely on students’ eligibility for free- or reduced-price lunch as an indicator of poverty, but some districts also consider other factors such as homelessness, residence in foster care, or eligibility for supplementary nutrition assistance. Incentivize the creation of high-performing, diverse-by-design schools. There are many different types of schools—magnets, charters, and charter school networks—with a proven track record in improving school diversity, and states should encourage their proliferation. States should have dedicated funding streams that support high-performing, diverse-by-design schools. Support housing developing to foster more economic integration. States can foster economic integration by funding mixed-income housing development projects. State housing agencies can also work with state education departments in placing these housing developments in high-performing school districts. State governments should also outlaw policies and practices that exclude low-income families from wealthy developments. Local municipalities tend to impose strict requirements—such as on land use, building codes, number of residents, minimum lot sizes, and more—to deter low-income, multigenerational families from living in affluent suburban areas.121 States should prohibit against such exclusionary measures. State legislatures should create laws and policies that not only allow but also incentivize schools to enroll students from several municipal boundaries. One way to do this is for states to authorize the development of regional charters, which enroll students from geographic areas beyond traditional school district boundaries. Following in the footsteps of states such as Rhode Island, this authorization should permit establishment and operation of a regional charter school by a school district, independent nonprofit organization, higher education institution, mayor, or local elected official. Equalize funding across and within districts. Inequitable funding systems in Illinois and other states promote economic segregation by making local areas overly dependent on local funding for schools. Because student funding in these states is so dependent upon neighborhood wealth, school districts are incentivized to create boundaries that exclude lower-income neighborhoods. States should equalize funding across economically disparate districts in order to mitigate these perverse incentives. Fiscal inequities also persist within school districts. In a school district, the better-resourced schools tend to serve high-income populations in affluent communities, and the under-funded schools tend to serve low-income populations in disadvantaged communities. States should equalize funding across all schools within a district to minimize this relationship. Track and report patterns of school segregation. Include local parents in economic integration plans and provide specialized programs that appeal to a range of families. 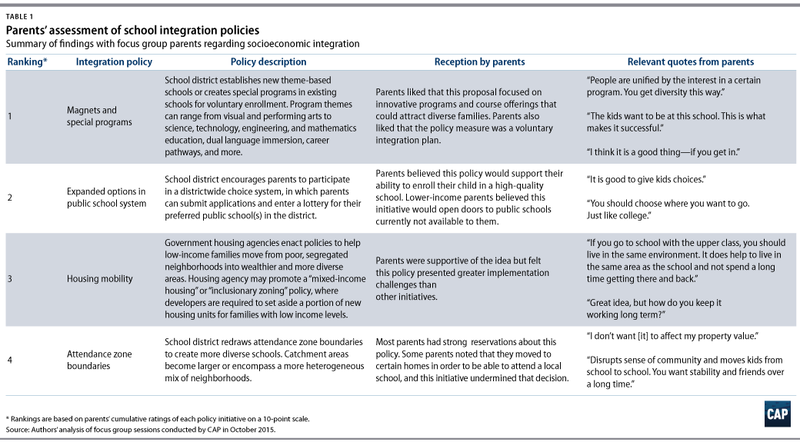 CAP’s focus group research shows that parents do not want economic integration policies to be a mandate. Before embarking on an economic integration plan, districts should include parents during the planning stages as a way to build trust and create buy-in. Districts should regularly consult racially, ethnically, and socioeconomically diverse parents to review progress on their economic integration plans and implementation efforts. Districts should also utilize parental involvement events, for example, back-to-school nights or parent coalition meetings, as spaces to explain or sell the benefits of school diversity. One of the biggest barriers to integration is parent opposition, but strong communications and messaging efforts can hurdle these barriers. Districts should also focus on methods of socioeconomic integration that increase the availability of special programs and improve school quality. When the authors polled the parent focus groups to see which methods of socioeconomic integration appeal most to them, parents voiced the greatest support for special programs. They liked that the approach incentivizes families to make changes on their own, and “opt in” to diversity. They also appreciated that fact that the policy would not force their children to change schools. Parents voiced particular enthusiasm for technology-themed schools and dual-language immersion programs, and districts should consider placing these theme-based programs in low-income and underperforming schools. This strategy would attract high-income families to schools that they may not have previously considered. However, districts should ensure this approach does not displace currently enrolled students who come from low-income backgrounds or who have a lower record of achievement. Districts must consider socioeconomic status in their student assignment and enrollment procedures. It is simply insufficient to assign children to schools based solely on where they live; for decades, that type of assignment system has perpetuated both school segregation and racial and income achievement gaps. One of the most effective diversity strategies is a lottery system that assigns students to schools but gives preferences or “weights” to low-income students. During the assignment process, administrators should account for parents’ preferences as well as their socioeconomic status, including their level of education, income level, and primary language spoken in the home. Each school year, the district should monitor school diversity as neighborhood demographics shift over time. Allow and encourage interdistrict and intradistrict transfers. Apart from controlled choice programs, districts can also consider interdistrict and intradistrict transfers as a viable method of school choice. Under this plan, parents can enroll their children in another school or district, other than the one they were originally assigned, given space availability. Fundamentally, public schools are segregated because residential neighborhoods are segregated. As discussed above, creating neighborhood communities that reflect the demographics of the country is a critical step toward economic diversity. Inclusionary zoning policies that require the creation of affordable housing in higher-income neighborhoods help to create more integrated neighborhoods and, ultimately, schools. Redraw attendance zone boundaries to ensure neighborhood schools draw from an economically diverse student population. Districts should shift away from the traditional notion of a neighborhood school and redraw attendance zone boundaries so that they transcend neighborhood lines. As detailed in this report, Berkeley Unified School District in California has created a district of high-performing diverse schools using this approach. However, this is a less popular approach among parents compared to expanded school options and special programs. Also, if districts need to create new schools to accommodate a growing population, they should be strategic in locating these schools in areas nested between low- and high-income neighborhoods and ensuring that student attendance policies work to create diversity at those schools. Fund capacity building for diverse schools. Integrated schools need support. It is not enough for these schools to simply enroll an economically diverse group of students. In fact, having a diverse student body is just the first step in creating a successful, diverse school community. While data may show economic integration at the school level, segregation can still take place at the classroom level due to tracking or differences in treatment, supports, and services students receive. Diverse-by-design charter school networks, such as Citizens of the World Charter Schools,125 have found that it takes intentional work from network and school leaders, as well as classroom teachers, to develop a school curriculum and culture that meet the needs of a culturally and economically diverse student body. Districts should invest in the development of successful learning models for diverse schools, including professional development for school personnel that empowers them to address students’ socioemotional needs and create inclusive school communities. Districts should also consider hiring additional counselors and school climate coordinators, who can develop strategies to promote a positive school climate among a racially, ethnically, and socioeconomically diverse student body. The economic and racial makeup of most classrooms today fail to reflect the rapidly changing demographics of the nation. Although the United States is growing increasingly diverse, the diversity of its public classrooms remains stagnant. The authors believe that the cultural divides permeating this country can be alleviated if students are educated in socioeconomically diverse schools. Yet, in many ways, school integration continues to be a policy that nearly everyone supports but almost no one is pursuing. As detailed in this report, there are school districts that have proved socioeconomic integration is possible; therefore, creating integrated schools is more so a matter of will, rather than one of viability. Although the U.S. Supreme Court found more than 60 years ago that segregated schools are inherently unequal, this principle has proven to be an insufficient motivation for school, district, state, and federal leaders to prioritize this issue. And the decades of research demonstrating the substantial benefits of school diversity have also proven insufficient to move most leaders to act. It is past time for education leaders to act on integration. School economic integration presents one of the most viable solutions to the inequities ripping at the fabric of the nation. CAP’s hope is that this report will provide clear data and next steps that support an increase in school diversity and, ultimately, educational equity. Ulrich Boser is a senior fellow at the Center for American Progress. Perpetual Baffour is a research associate with the K-12 Education Policy team at the Center. The authors partnered with EdBuild in the analysis of intradistrict segregation. Special thanks to Rebecca Sibilia, Kailey Spencer, and Sara Hodges at EdBuild for their leadership in the analysis and insights on the findings. Special thanks also go to Halli Bayer, who contributed with writing. Additionally, the authors would like to extend thanks to Michael Bocian, Jim Gerstein, and Jerel Williams at GBA Strategies for their contributions in planning, organizing, and facilitating the focus group sessions. Special thanks also go to Jesse Chandler, for his services in building the survey on the Mechanical Turk platform. The authors would also like to thank Lauren Bauer at the Brookings Institution for her assistance with the survey analysis and insightful commentary. Special thanks go to John B. King Jr. of The Education Trust for lending his expertise on the report and providing insightful commentary. In addition, the authors would like to extend thanks to Carmel Martin, Catherine Brown, and Scott Sargrad at CAP for their intelligent feedback on the report. Special thanks also go to Richard Kahlenburg, Halley Potter, and Kimberly Quick at The Century Foundation for their expert feedback on the report. Thanks also go to former interns Cecil Carey, Erica Jordan, and Sydney Young for their research and writing assistance. In other words, the Hypersegregation Index is a measure of the proportion of schools in the district that look very different from the district as a whole in terms of the enrollment of FRPL eligible students. A Hypersegregation Index score of .45 would show that 45 percent of schools in a given district have an FRPL rate that was 20 percentage points above or below the district FRPL rate. This is a measure of evenness. For example, a district with an Isolation of Poverty Index score of .60 percent indicates that 60 percent of FRPL-eligible students in a district attend schools with FRPL rates above 75 percent. This is a measure of exposure. For the purposes of reporting these data, the authors established a definition of a “hyperisolated district” as a district with 50 percent or more of FRPL-eligible students attending schools with an FRPL rate above 75 percent, or a district with 50 percent or more non-FRPL students attending schools with an FRPL rate below 25 percent. The outcomes of the Isolation of Poverty Index and Isolation of Wealth Index are highly correlated with district FRPL rates because districts with very high or low populations of FRPL- eligible students are much more likely to be economically isolated. Because of this correlation, the authors rely on the Hypersegregation Index to identify the most- and least-segregated districts, while including the Isolation of Poverty Index and Isolation of Wealth Index data as measures of further insight. Districts that did not report FRPL rates for charter schools—there were 62 such districts, mostly in California, Oregon, and Tennessee. Because the Hypersegregation Index is a measure of the proportion of schools with FRPL rates more than 20 percentage points away from the district FRPL rate, districts with very high or low FRPL rates would be more likely to score low on this index even though their schools are not necessarily integrated. With these exclusions, the analysis sample includes 1,717 school districts, 41,102 schools, and 27,384,801 students; these numbers are equal to 11 percent, 47 percent, and 58 percent within districts that have available FRPL and enrollment data, respectively. In other words, the authors excluded the vast majority of districts, half of schools, but the district and schools included account for about 60 percent of the nation’s students. In a fair and just school district, how many lower-income and higher-income students should attend low-, mid-, and high-poverty schools? In your local school district, how many lower-income and higher-income students attend low-, mid-, and high-poverty schools? In the country at large, how many lower-income and higher-income students attend low-, mid-, and high-poverty schools? Do you agree that school integration will improve the quality of education received by lower-income students? Do you agree that school integration will improve the quality of education received by higher-income students? How important is the issue of school segregation to you? The survey defined low-poverty schools as schools where 25 percent or less of students come from low-income families. The survey defined mid-poverty schools as schools where 26 percent to 74 percent of students come from low-income families. The survey defined high-poverty schools as schools where at least 75 percent of students come from low-income families. The survey also established definitions of “low-income” and “high-income” using an annual household income threshold of $50,000—with households above $50,000 being considered high income with the converse being true. The survey did not include any questions about racial integration. The authors conducted focus group sessions with parents of school-age children enrolled in traditional public and charter schools. The sessions were held on October 8, 2015, and October 15, 2015, in Baltimore and Bethesda, Maryland. Participants were divided into four separate groups based on race and socio-economic background. The Baltimore groups consisted of white parents who were divided into two groups—one group of parents with college degrees and household incomes of $75,000 and higher, and the second group consisted of white parents without college degrees and household incomes of $50,000 and lower. The Bethesda groups consisted of African American and Hispanic parents who were divided into two separate groups, based on the same socioeconomic divisions as the Baltimore groups. Participants’ children ranged from kindergarteners to high school students across the Baltimore and Washington, D.C., metro areas.